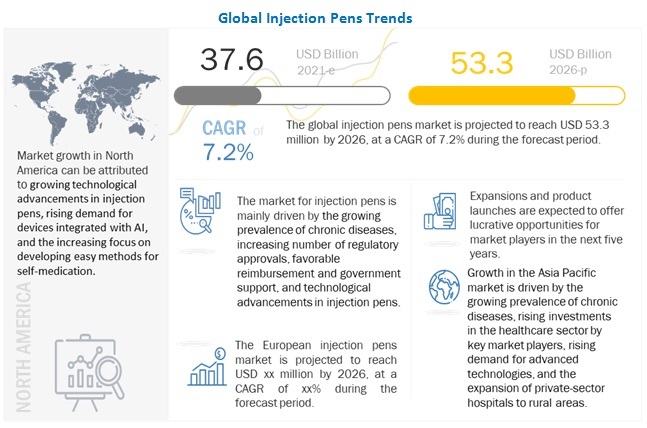 [136 Pages Report] The global injection pen market was valued at USD 29.47 Billion in 2016 and is projected to reach USD 41.38 Billion by 2022, at a CAGR of 6.0% during the forecast period. Base year considered for the report is 2016 and the forecast period considered for this report is 2017–2022. Top-down and bottom-up approaches were used to validate the size of the global injection pen market and estimate the size of other dependent submarkets. Various secondary sources such as the International Diabetes Federation, World Heart Federation, International Council of Cardiovascular Prevention and Rehabilitation (ICCPR), International Osteoporosis Foundation, Autoimmunity Research Foundation, National Diabetes Services Scheme (NDSS), American Diabetes Association, Statistics Canada, American Association of Diabetes Educators (AADE), American Heart Association, American Autoimmune Related Disease Association, European Association for the Study of Diabetes (EASD), European Society of Endocrinology, European Society of Cardiology, Asian Association for the Study of Diabetes (AASD), ASEAN Federation of Endocrine Societies, Asian Pacific Society of Cardiology, Japan Endocrine Society, Brazilian Society of Endocrinology and Metabolism (SBEM), Brazilian Diabetes Association (ADJ), Latin American Diabetes Association (ALAD), directories, industry journals, databases, press releases, and annual reports of the companies have been used to identify and collect information useful for the study of this market. The major players in the global injection pen market are Novo Nordisk (Denmark), Eli Lilly (US), and Sanofi (France), Merck (US), Ypsomed (Switzerland), AstraZeneca (UK), F.Hoffman-La Roche (Switzerland), Becton Dickinson and Company (US), Owen Mumford (UK), Novartis (Switzerland), Pfizer (US), and Haselmeier (Switzerland). 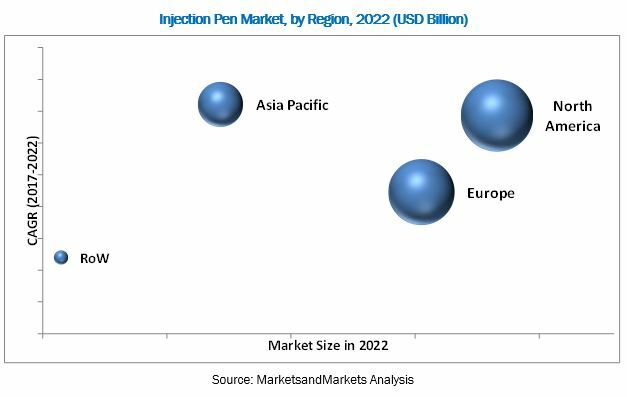 The global injection pen market is projected to reach USD 41.38 Billion by 2022 from USD 30.97 Billion in 2017 at a CAGR of 6.0% during the forecast period. The growth of this market is primarily driven by factors such as the growing prevalence of chronic diseases, increasing number of regulatory approvals, and favorable reimbursement in developed countries, and government support. The market is segmented on the basis of type, therapy, end user, and region. Based on type, the market is segmented into disposable and reusable injection pens. The disposable injection pens segment is expected to grow at the highest CAGR during the forecast period. The high growth of this segment can be attributed to the benefits disposable pens offer, such as portability, ease of use, and low possibility of infection. Based on therapy, the global injection pen market is segmented into diabetes, growth hormone therapy, osteoporosis, fertility, and other therapies (such as multiple sclerosis, obesity, cardiovascular diseases, rheumatoid arthritis, and migraine). The diabetes segment is expected to grow at the highest CAGR during the forecast period. The high growth of this segment can be attributed to the large diabetic population across the globe and the favorable reimbursement scenario for diabetes treatments in developed countries. Based on end user, the global market is categorized into homecare and hospital & clinics. The homecare segment is expected to register the highest CAGR during the forecast period due to the growing demand for self-administration drug delivery devices and the growing prevalence of chronic diseases. Geographic segments in this report include North America, Europe, Asia Pacific, and RoW. Of these, the North American segment is expected to account for the largest share of the market in 2017. The large share of this region can be attributed to the rising prevalence of diabetes, favorable reimbursement scenario, and the increasing number of awareness programs in this region. Preference for alternative drug delivery modes and poor reimbursement scenario in developing countries is expected to restrain the growth of this market during the forecast period to a certain extent. For instance, in emerging countries such as China and India, no coverage is provided for the home medical devices such as injection pens, thus increasing the out-of-pocket expenditure by patients. The global injection pens market is dominated by Novo Nordisk (Denmark), Eli Lilly (US), and Sanofi (France). These players adopted growth strategies such as product launches, mergers & acquisitions, and expansions to maintain and enhance their position in the market. Other prominent players in the market include Ypsomed (Switzerland), Merck (Germany), AstraZeneca (UK), F. Hoffman-la Roche (Switzerland), Becton, Dickinson and Company (US), Owen Mumford (UK), Novartis (Switzerland), Pfizer (US), and Haselmeier (Switzerland).